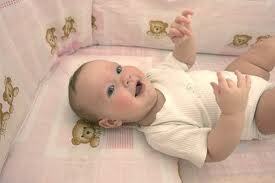 Stuffy babies usually do not have colds « Howard J. Bennett - Pediatrician and Author in Washington, D.C. In the first few months of life, babies are obligate nose breathers. This means that they have to breathe through their noses. By the time babies are three to six months of age, they are able to breath through their mouths, but most still prefer nasal breathing. Because babies breath through their noses, they make all sorts of noise—snurgles, snorts, and other sounds that mimic a cold. If a baby truly has a cold, he will have a runny nose and a cough. The reason this distinction is important is because many parents feel the need to clean their baby’s noses if they are stuffy. As long as your baby can feed easily, you do not need to (a) put saline drops in his nose or (b) clean his nose with a nasal aspirator. If your baby is so stuffy that she cannot feed properly, you should discuss this with your doctor. This entry was posted in Dr. B's Blog and tagged colds, ear nose & throat, newborn care, upper respiratory infections. ← Should you give your child fever medicine before a doctor’s visit?